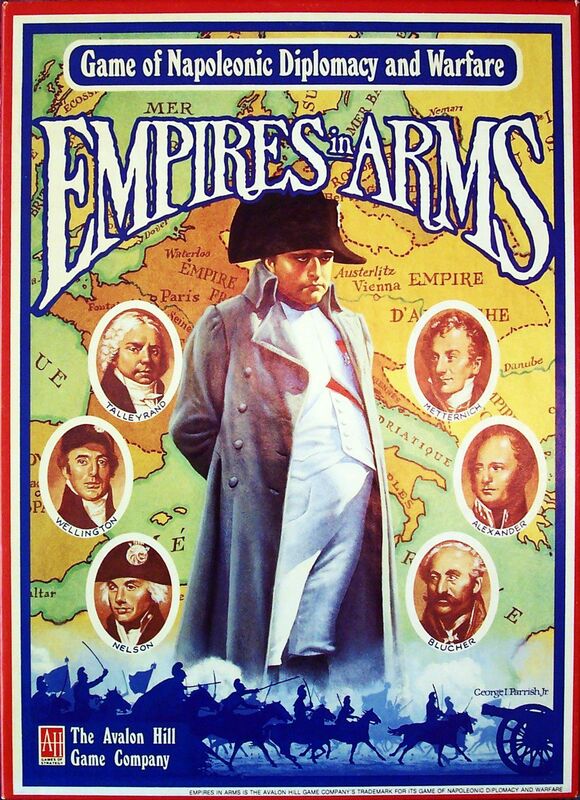 (from the back of the box - Avalon Hill edition:) EMPIRES IN ARMS is a game covering the major elements of diplomacy and warfare during the Napoleonic Wars of 1805-1815. YOU, as a player, are the absolute monarch of a major European power (Austria, France. Great Britain. Prussia. Russia, Spain or Turkey) and guide that nation through the maze of conflicting interests and ambitions that characterized Napoleonic Europe. Each major power has its own individual economic; military and geographic advantages and disadvantages. Players negotiate alliances. dictate peace treaties. administer conquests and conduct warfare on land and sea by maneuvering corps and fleets in the constant struggle for survival and prestige. • Numerous Scenarios : These vary in size and length from the four-Turn. two-player 1805 Scenario to the 132 Turn, seven-player Grand Campaign Game (1805-1815). • Great Military Leaders : Napoleon of France. Nelson of Great Britain. Blucher of Prussia. Prince Charles of Austria and many, many more • Uncontrolled Major Powers : Rules that allow the realistic use of extra major powers in campaign games when less than seven players are available • Unique Combat Systems : Land combat takes into account the effects of leadership, grand-tactics and the numbers, morale and types of troops present. Sieges include stormings and sorties. Sea commanders try to hold the "wind-gauge". Massed shore batteries protect harbors from blockading enemy fleets. • Economic System : Money and manpower availability from home provinces and conquests determine recruiting and national strength. CONTENTS: 1008 Die-Cut Counters Two 25" by 35" mapboard 1 Rulebook 2 Dice 1 Double sided Display Charts/Forms 2 Identical Double sided Charts/tables reference page 7 National Cards (BGG description :) A game covering the major elements of diplomacy and warfare during the Napoleonic Wars of 1805-1815. Each player is absolute monarch of one of the major powers(England, France, Austria, Russia, Prussia, Spain and Turkey). The full game lasts 132 turns 1 for each month approx playing time is 100-150 hours. Each month is split into 4 phases: The Diplomatic phase where players negotiate deals, forge alliances etc. The Reinforcement phase where each player in sequence adds reinforcements due. The Naval phase each player conducts naval moves in sequence. The Land phase where each player moves and fights with his armies in sequence. And then every third month an additional phase is added: The Economic phase, which is where players collect resources and purchase future reinforcements. To win the game each nation needs to amass victory points these are scored in the economic phase and are based on your nations political status. As status always gravitates to a central position players must continually "politik" to reach their goal.